@ Gallery on Queen, Fredericton N.B. Verdant | Exhibition featuring: Beth Biggs, Janice Wright Cheney, Linda Kelly and Sarah Maloney | @ Gallery on Queen, Fredericton, New Brunswick. Lush greens, acidic yellows and warm browns permeate Linda Kelly’s carefully crafted images of common garden weeds and their roots. Each is a shoot and root system drawn or painted onto pages torn from vintage books and they are (put simply) exceptional. Kelly, in conversation with the exhibition’s co-curator Anne Koval, says about her piece Devil’s Paintbrush that she “admire(s) the weed’s tenacity”, which is an attribute that can by easily applied to the artist and educator herself. Kelly’s shoots are faithfully rendered yet it is the root systems that are really her subject. It is clear that it is they who most profoundly hold her attention and this subject – typically hidden from view – is what might challenge viewers to think more deeply about Kelly’s work. This spring, one hundred and fifty-one years post confederation, Indigenous educators like Nikki Sanchez (a PhD Student in Indigenous Governance at the University of Victoria) are reminding settler colonials that we need educate ourselves about our roots. “Know enough about who you are to know how you got here”. This is the beginning of dismantling privilege and being aware of Canada’s colonial structure, and it is a frame of mind from which to think politically about Linda Kelly’s verdant works in this show. Metalsmith Beth Biggs points out that she is creatively inspired to “explore the antagonistic relationship between life and death”. In Bigg’s hands, this predilection manifests itself in many exquisite forms including vessels and neckpieces. Her work Host(ess) is a scent bottle shaped as a rose and hosts a parasitic green aphid on top (the bottle’s stopper), the stem of which is sheathed in a sensuously shaped pearl. This piece of Bigg’s brings to mind the antonymic experience of reading Perfume: The Story of a Murderer (a novel by Patrick Süskind) the narrative of which, distilled-down, could be described as an examination of the intense and evocative feelings that attach themselves to scents. In 1986, the New York Times described that novel’s plot as “a meditation on the nature of death, desire and decay” and it is precisely this characterization that explains why Host(ess) brings this novel so firmly to mind. The pearl cupped stem of its blooming rose alone stirs a voyeuse-like feeling of titillation. Beth Brigg uses the traditional methods of chasing, repoussé and enameling in her metal works to tease out the curvilineal lines and organic emphasises that is popular in Art Nouveau inspired work, and which perfectly mirrors what she describes as “the desire of femininity” evident throughout in her practice. “Sugar Magnolia blossom blooming’s | Head’s all empty and I do not care”. One glance at Sarah Maloney’s patinated bronze series First Flower will have music fans humming the opening lyrics to the Grateful Dead’s famous song Sugar Magnolia; the details of Maloney’s construction are so botanically faithful. And yet, still closer observation quickly reveals Maloney’s brazen “hell with gentile blossoms” sensibility, which radiates from the powerful bronze works. Sarah Maloney is an artist who has, for years, moved seamlessly back and forth between the mediums of textiles, wood and bronze creating the illusion that such fluidity might be ‘no big deal’. In fact, it’s a very big deal, especially given that she makes the work herself rather than contracting the construction out to different specialist (think American ‘Boy Wonder’, Jeff Koons); look closely and you will see spots where her fingerprints remain in the casting. In an essay from 2011, craft historian Sandra Alfoldy describes Maloney’s approach to her work as an “unapologetic celebration of femininity, domesticity, and the loaded symbol of sexualized flowers”. Verdant features a number of Maloney’s striking textile pieces, as well as many works in bronze the magnolia flower is a tough, hard, adaptable perennial and for these reasons has come to represent endurance and long life. Maloney’s pieces remind us that women are also resilient and adaptable, and her unflinching works in Verdant caution us not to forget, nor underestimate, this fact. The artists in Verdant turn a deaf ear to all stale, patriarchal, ‘rules’ having to do with the division of gender spheres – male (public/social) vs. female (domestic/private) – including worrying about using any tools, materials and/or subjects that might be thus stigmatized. Beth Biggs, Janice Wright Cheney, Linda Kelly and Sarah Maloney remind us that reclamations may be quiet – may be slow – but that with reclamation comes power and responsibility; they will accept nothing less. Danielle Hogan is an interdisciplinary artist, writer, curator and practice-informed researcher with a Ph.D. from the University of New Brunswick. She currently resides in Fredericton, Canada, which sits on traditional unceded territory of the Wolastoqiyik and Mi’kmaq peoples. Cross-stitch homage to Judge Rosemarie Aquilina! Icon in the fight for Women’s Rights. Download your pattern here Judge Rosemarie Aquilina. Free, from us at The GAG! During the month of October the GAG is celebrating it’s second birthday. Hope to see you out and about, creatively working for positive change! We participated in the opening celebrations at the Beaverbrook Art Gallery’s new pavilion opening – working with the public to create personal, activist, textile banners. We would like to begin by acknowledging that the land on which we gather is the traditional unceded territory of the Wolastoqiyik (Maliseet) and Mi’kmaq peoples. This territory is covered by the “Treaties of Peace and Friendship” which Wolastoqiyik (Maliseet) and Mi’kmaq peoples first signed with the British Crown in 1725. The treaties did not deal with surrender of lands and resources but in fact recognized Mi’kmaq and Wolastoqiyik (Maliseet) title and established the rules for what was to be an ongoing relationship between nations. Shannon Alexis and her banner. This banner was created and hung anonymously at the event – and we couldn’t agree more! Cover charge of 10$ includes a free transfer (stencil) onto an article of clothing or, linen of your choice. You bring the item and pick the stencil – we apply it and it’s ready to pick up before you leave the pub! Courtesy of your wonderful GAG volunteers! 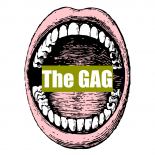 The GAG is hosting a fundraiser pub night at the Wilser’s Room in Fredericton. All proceeds from the event going to Clinic 554 in recognition of their continued dedication to patient-driven health care centred upon caring, inclusiveness and respect. We’re hosting a pub party! Be sure to be in Fredericton on Fredericton 2017 because The GAG is hosting a get-along! We’ll be at the Wilser’s Room in the Capital Complex. Come raise a glass with us! CHECK BACK HERE – More details soon!! Today (August 11th) I had the chance to interview the Argentinean/Spanish artist Señorita Lylo at JIWAR in Gracia, Barcelona. It was such a privilege to speak with Señorita Lylo, she is not only a gifted artist but also truly a very kind human being. Keep an eye on the gallery for my upcoming article about our meeting. It should be out in a month or so! In the mean time, check out her work on Tumbler and also, you can take an online course with her here! You can now follow The GAG on Twitter!! We’re looking to put down ‘roots’ in Toronto! Reach out and let us know what you’re up to so that we can dig in for the gallery! The GAG is coming to Toronto!